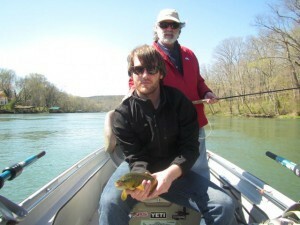 There is always something special about a father and son fishing together. It is always an interesting experience to watch the interaction between father and son spending a day together on the river. Even more interesting when it is their first experience with the sport of fly fishing. 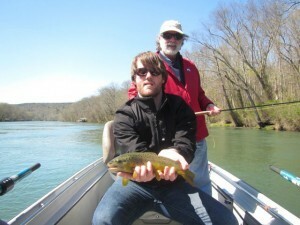 That was the case on Monday with Jeff and his son, Matt, as they joined us for a day on the Little Red River and an introduction to fly fishing. This was the first fly fishing experience for both Jeff and Matt so we spent the first couple of hours talking about what trout eat and tying a few flys that imitate their food supply. We also worked on several knots that are essential for any angler and then spent some time on fly casting and rod rigging. As usual, once we got on the river in a real fly fishing situation, with the addition of a stiff wind, the casting became a challenge. 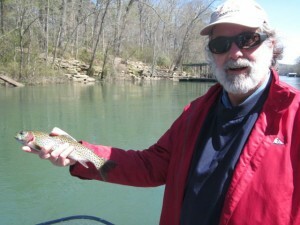 However, both anglers were hooked up to their first trout on a fly within fifteen minutes. As the day progressed both Jeff and Matt caught several fish including a nice Brown Trout for Matt as their casting continued to improve during the day. All in all a very enjoyable day for both father and son.